And I'm going to be singing right along with you, Lynn!! 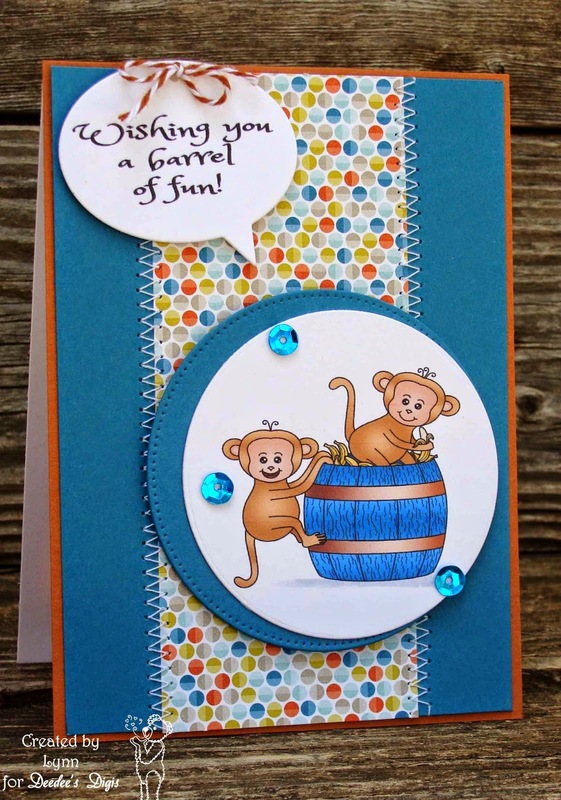 What a fun card with these cute monkeys and your stitching and sequins! What a fun card. Love your patterned paper to go with these guys and your stitching looks fabulous! This is such a fun card. Cute barrel of monkeys! Have a wonderful weekend. We're having a rainy one. Fabulous layers and colors Lynn, love the stitching and adorable little monkeys. OH Lynn, this is just toooo cute! Love these adorable little monkeys and what a great design. I do so love these cheeky monkeys Lynn! Fabulous sentiment too. Gorgeous card Lynn, I like the adorable image the colours and the stitching. Super cute image and the background is fabulous! Love the paper you used and the offset circle is just the right touch! Wonderful fun card! What a cutie Lynn, and I love those sequins and the way you have used them. Wonderful card!! A very cute card, Lynn! This is a fun set! I like your colour scheme! What fun!! I love how you offset the circles while matting them, and the stitching adds such a fun touch to this cute little card! Super fun card! Awww this is so cute Lynn! I love that image, the colorful paper and your fabulous stitching!! Your monkey are too darn cute for words and the DP and the colors are perfect with those wonderful sequins too! Wow! Cute card and look at you go! Sewing!!!! I don't think I've ever seen you use that on your cards. Oh my gosh...this is so darned cute! Love those little fellows. I am having a bit of difficulty with the stairs at the moment so not crafting...luckily I have a lot of cards made so can schedule posts. Bad knee...ice should eventually help! Love your paper, the sequins and best of all the offset image...that looks great! This is more fun than a barrel full of monkeys! Sorry, I just had to put that in here! Love the bright blues and polka dots and the adorable monkeys! Cute monkeys and that's a fab piece of paper you used! Oh I love it! I laughed at the blues not being the same - yesterday I was trying to make a card with a supposedly "coordinating" pack of paper - yep, blues don't match. Your little barrel of monkeys is adorable, Lynn....I especially love how you off set the image on the blue background layer...awesome design detail!!!! !